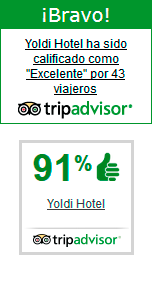 Hotel Yoldi, in the heart of Pamplona, has a floor of its hotel exclusively for women. In addition to having spacious and peaceful rooms of maximum comfort and all services (modern and renovated bathroom with hairdryer, air conditioning, safe, minibar, TFT LCD TV with PC connection and free WIFI) We grant an extra quiet for those women who travel alone and decide to use this plant exclusively for them. We have for them some other extras in these rooms (elements of perfumery, makeup and other practical tips …). We also have late check-out or late check-out service if you need to leave the hotel a little later than 12:00 noon on your departure day (maximum until 3:00 p.m., subject to availability of the hotel, and Under petition). if you make your reservation through our web only you will pay 6€ for each buffet breakfast!